The strawberry, a member of the rose family is a juicy, red berry shaped like a small cone, and has grown wild in forests in South and North America, as well as in Europe since the Roman times and for centuries before. During these ancient times the fruit and its leaves were valued for its therapeutic powers, for everything from loose teeth to gastritis. It is said that cultivation of that plant began during the 13th century. 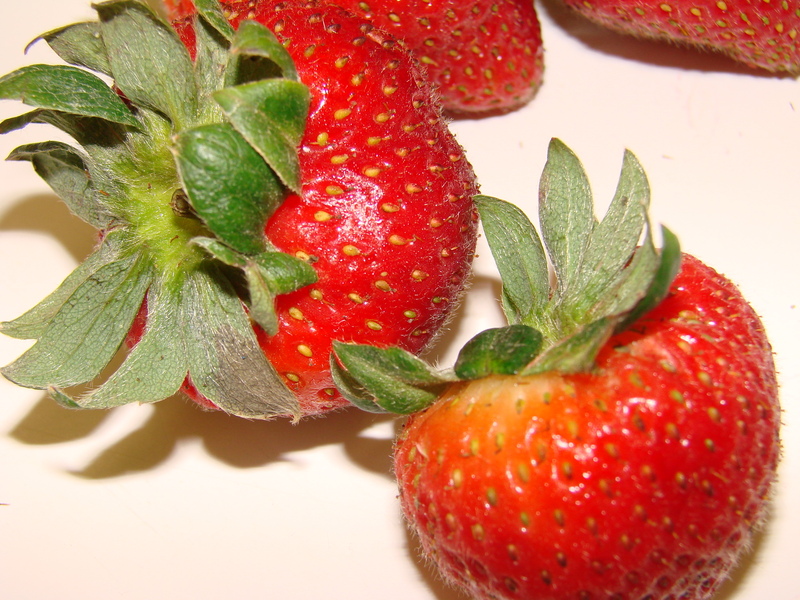 The most common American variety is the result of several centuries of crossbreeding of the wild Virginia strawberry, Fragaria virginiana, which is North America’s main native strawberry, and a Chilean variety Fragaria chiloensis. In the 16th century the doctors advised against eating too many of these berries, believing that they were unhealthy if eaten in abundance. John Gerard, a 16th century physician and herbalist, cultivated more than two thousand strawberry plants in his London garden and spoke of the berry as having “vertues,” and suggested distilling strawberry water and drinking it with white wine. ” This concoction”, he said….. Early on the berries had to be picked in the forests and brought to the market quickly so they could be sold even quicker. 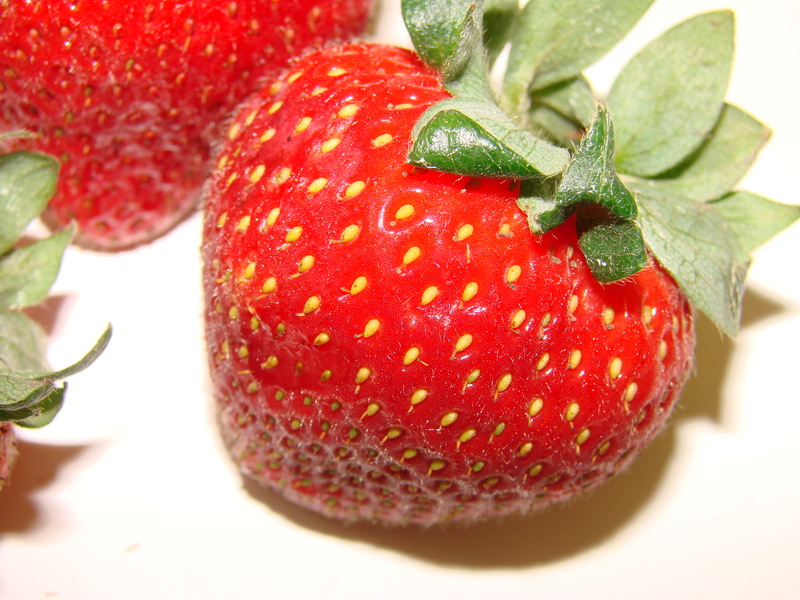 The strawberry was the first packaged food. It was brought to the markets and sold in cone-shaped straw baskets. Due to the slow picking of the berries and having to bring them quickly to the town’s market places it was very costly. Therefore, strawberries were considered a snobbish food, much the same as caviar is regarded today, and were eaten for pleasure only. Strawberries on a Sunday Afternoon! My father worked for a transportation company in Croatia just before the end of WWII. We had a flat at the train station in a little village called Drenovac which was located in the mountainous area of that country. A local transportation company carried logs by train out of the forests to Belisce where the logs were made into lumber material at the Gutmann Factories. At that time, my father, at that time, was the respected young station manager who lived by the clock conducting the arrivals and departures of the freight trains. Even though his job was strenuous he loved to entertain. My mother being an excellent cook and with the help of her Viennese cookbooks she prepared meals which their guests praised as being better than in any restaurant in the capital of Austria. On one particular Sunday, the midday meal had been started early in the morning. Our maid had the task of going to the garden to pick fresh vegetables and herbs. I remember, running after her in my pajamas through the wet grass and feeling the coolness of the dew and the little pebbles under my toes. I helped her bring the vegetables to the kitchen, washing them first in a bucket of water, which she drew from the well. The guests were the local doctor whom I called Onkel Dokaka, and who’s jacket pockets I was allowed to inspect as soon as he arrived through the kitchen door. He always had little gifts for me tucked in them. Then he quickly lifted the lid of every pot on the stove to smell what was being cooked. The other guests were the owner of the only store in the village, where staples and household items were sold. The Catholic and the Serbian Orthodox priests and the Forest Ranger and his wife. Everyone gathered in the living room for a shot of Slivovic, the locally three times distilled plum brandy. 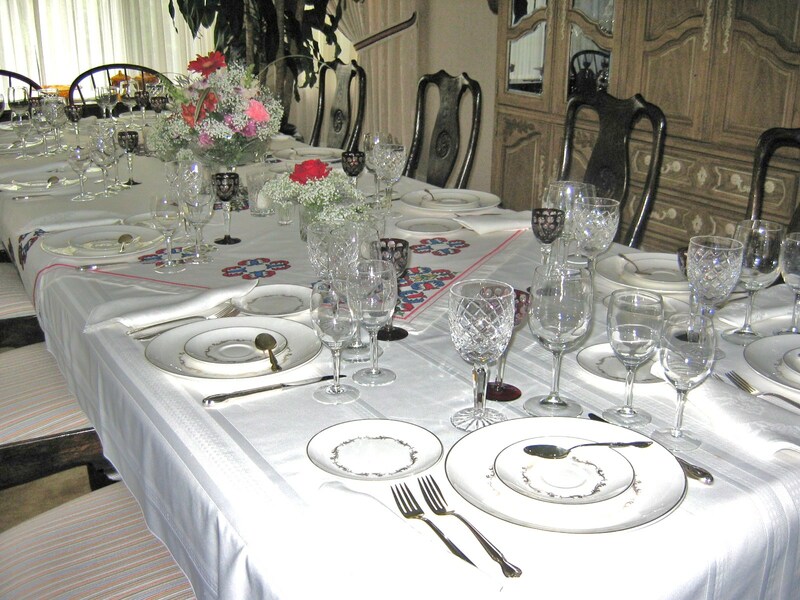 When the meal was ready and everybody was seated at the table beautifully set table with linens, silver and crystal, my father started the meal with a toast to his friends, their health and happiness. I was not allowed to sit at the table, but ate with the maid in the kitchen. was quite similar to this one. The first course was a sweet-water fish from the mountain streams, quickly sautéed with a slice of lemon on the side. Homemade tartar sauce always accompanied my mother’s excellently prepared fish. I never liked fish as a child and, to my delight I was not forced to eat it. But the Esterhazy Steak with little fried potato dumplings, a fresh butter lettuce salad with a light vinaigrette was my most favorite meal. The dessert or “Nachspeise” was “Walderdbeeren mit Schlag,” or wild strawberries with whipped cream and a splash of Kirsch (the highly distilled Cherry Brand), all dusted with powdered sugar. The strawberries were brought in a bucket by the forest ranger and his wife. He had them picked that morning at dawn by some of his employees. These were the most beautiful red berries still glistening with the drops of dew on them, while the little green leaves covered them like a blanket. My mother had forbidden me to eat any of the strawberries since I had gotten sick from them once before. 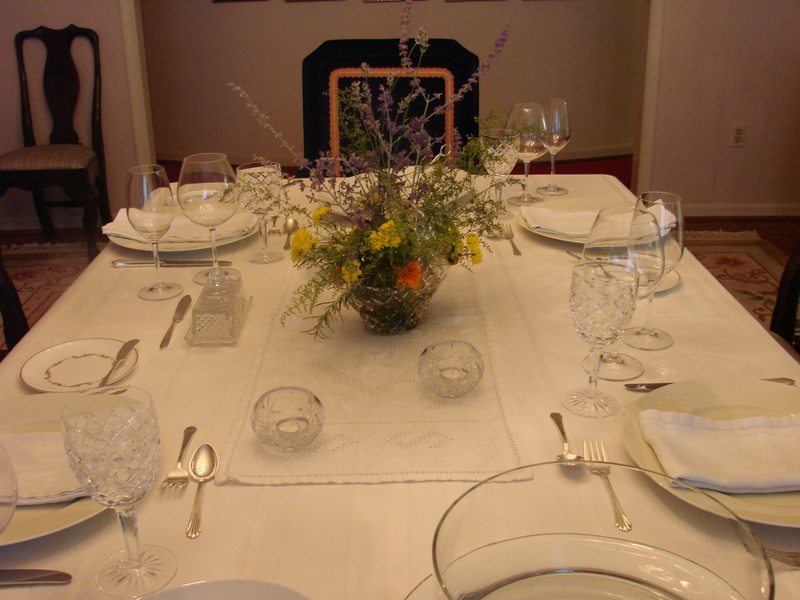 But, as the meal progressed and everyone felt their good spirits rise with the wine and song, I tip-toed into the dining room to see our guests. While chatting with the forest ranger’s wife she gave me a strawberry with a dollop of cream. To this day I can remember the sweetness in my mouth and swallowing it with such delight. The little wild strawberry taught me not to lie! And I was only 3 years old. It was not long after this most happy moment, feeling that I had circumvented my mother’s order and she would never know that I ate a strawberry after all, when I felt very itchy on my face, arms and legs and then my whole body became bumpy with red hives. She rushed to me in horror and fear asking me if I had eaten a strawberry. I shook my head and denied that I did while tears gathered in my eyes. Well, my Onkel Dokaka was ready with his little doctor’s bag, and horrors of all horrors I got an injection, which sent me off to never-never land. When I woke up my mother was holding me in her arms and had a very knowing smile on her face. This was the moment I realized that I could never lie to my mother, she would always know! 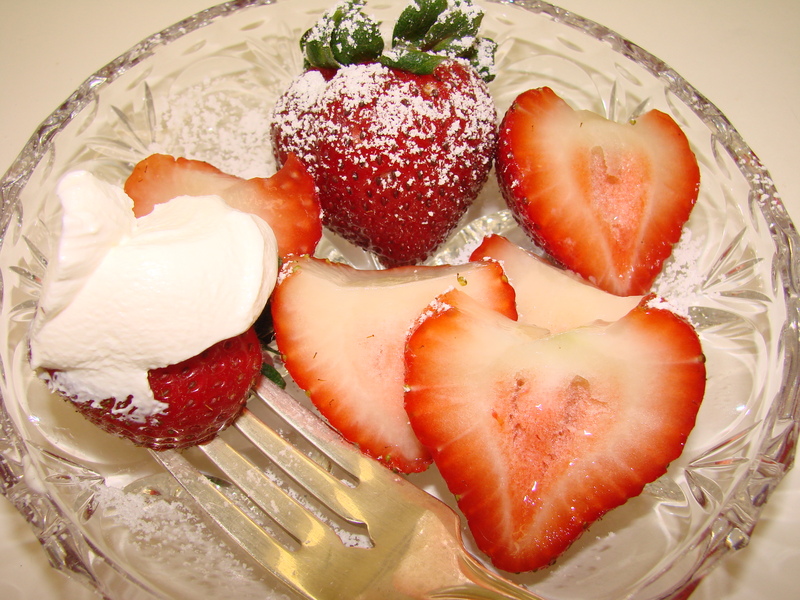 Here are my favorite Strawberry recipes! Combine sugar and water in small saucepan. Over medium heat stir sugar until it is dissolved. Just before syrup comes to a boil – remove from heat. Add syrup to remaining ingredients and blend well. Place into ice-cream maker or freeze in trays. Serve in “tulips” and garnish with a fresh strawberry. 1 cup fresh, sweet strawberries chopped and mashed. In a little bowl add 1/3 cup water to the gelatin – let it rehydrate. When water is completely absorbed – melt gelatin in microwave. When melted add warm gelatin – cool to room temperature. 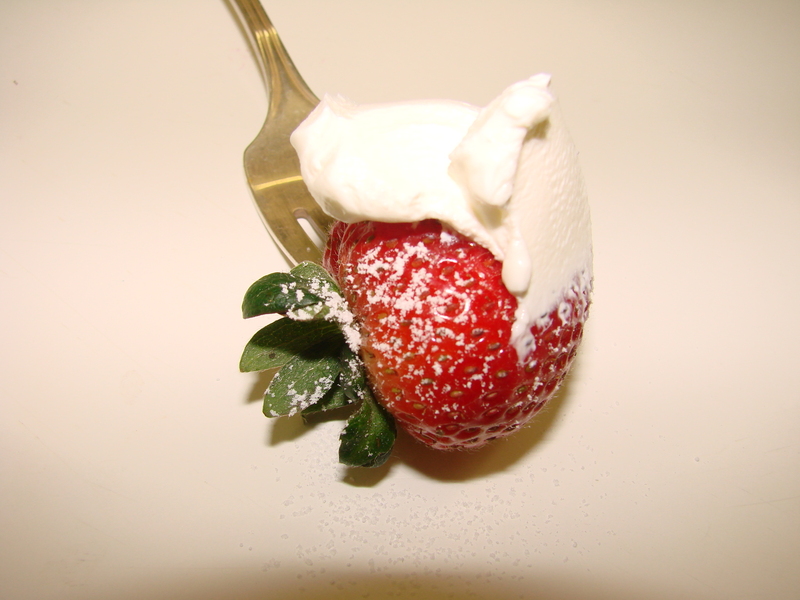 Whip cream then add the mashed strawberries and cooled gelatin. and, or white whipped cream. Before serving pour 1 Tbsp of liqueur over mousse. With sugar and whipped cream! Maja’s Kitchen needs your vote on.. Thank you…. for keeping up with the voting! 2,000 votes are needed to be inducted into the Hall of Fame! Since we don’t even have rhubarb yet here, I can dream through you. We are having them after dinner tonight… still a few hours out for us. Just read about roasting strawberries. Have either of you done that? Wonderful blog post and recipes. Your stories are so interesting to read. I love reading your blog, Maria! Strawberry season is over where I live. There’s only one saving grace for that – blueberry season! Yum, Yum, and yes, YUM!!! I saw the post and the recipe for the Fresh Strawberry Sorbet! Delightful!! 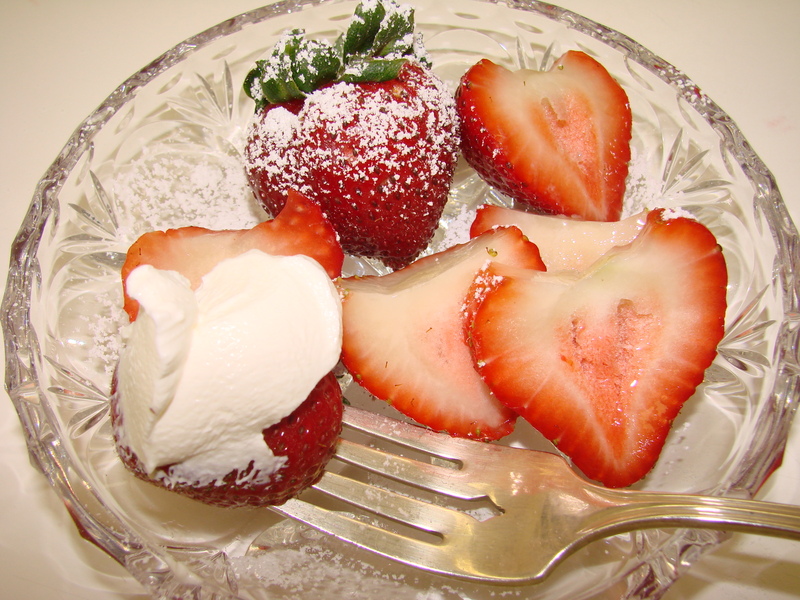 Love the strawberries with whipped cream and sugar: perhaps best way to eat them! I love this enchanting story Maria….I honestly think you may consider putting all these blog posts into a book together with the recipes…I am sure it would do enormously well. Thank you for your lovely words of encouragement …..
You always give me strength to write the next story……. Lots of love to you…………..
Love it! Strawberries are some of our favorite. Trying to grow some in the yard, but the rabbit that now lives in our yard decided the plants were better for dinner….oh well, I guess I’ll keep hitting the farmers market! It is always so nice to read your comments………..I am sorry about the rabbits…….we have lots of deer that come and nibble on anything they like……I have given up growing just about everything…..except herbs………. And……I love herbs so it was not a difficult to concentrate on them………. What a beautiful blog, Maria. Those strawberries look so good. I want some. Thanks for the sorbet recipe. 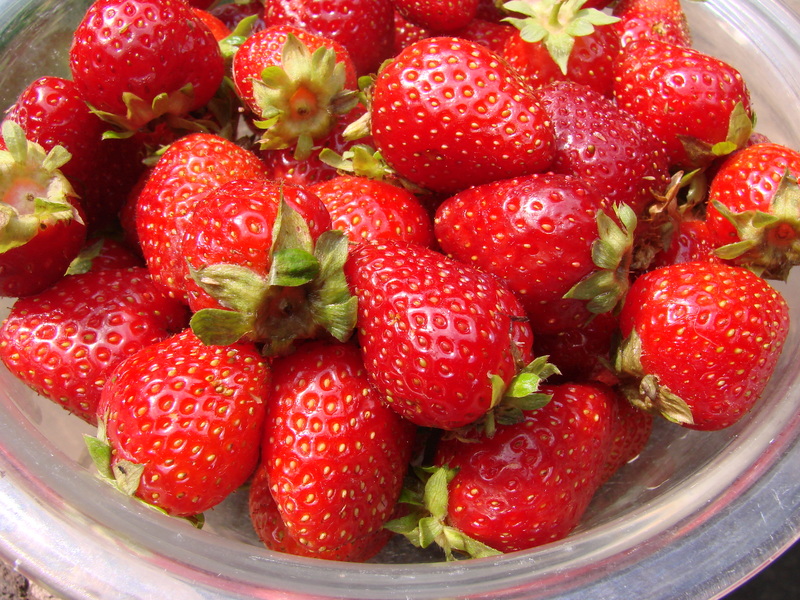 Can’t wait to get my hands on local strawberries so I can make some. Thank you ………Risa, for your nice comment! Once again a sweet story about you and your family. Thanks for the recipes. I assume you don’t eat these wonderful berries anymore. 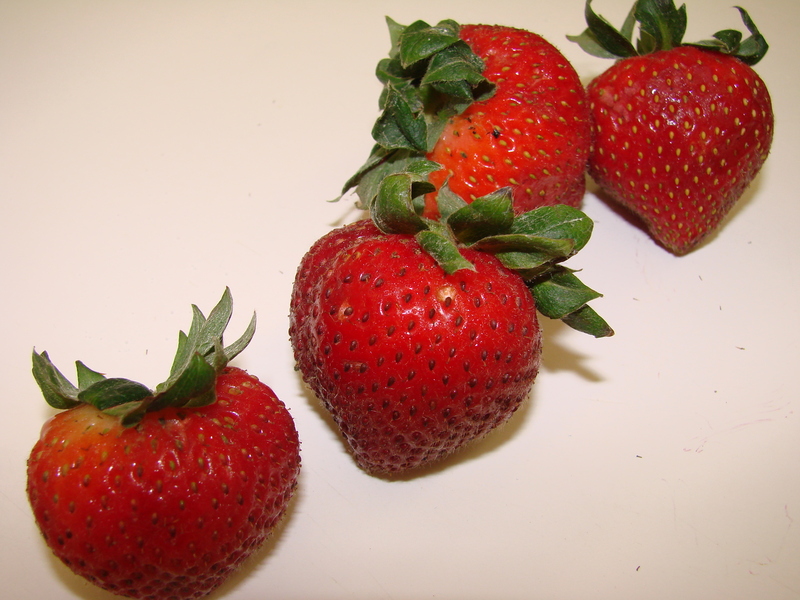 I do eat strawberries….and love them….I have overcome my childhood allergies….thank heaven!!! Thank you for leaving a comment……I love receiving them. on June 8, 2014 at 3:11 pm | Reply Balsamic Glazed Strawberries over Vanilla Ice Cream | Cooking With C.C.